The Mathematical Sciences Diversity Initiative is pleased to announce the 2017 Modern Math Workshop at SACNAS. This workshop is intended to encourage undergraduates, graduate students and recent PhDs from underrepresented minority groups to pursue careers in the mathematical sciences and build research and mentoring networks. The Modern Math Workshop is a "pre-conference" part of the SACNAS National Conference. Both the Modern Math Workshop and the SACNAS conference take place in the Salt Palace Convention Center in Salt Lake City, Utah. The Modern Math Workshop check-in/registration begins at noon on Wednesday, October 18, with the scientific programming beginning at 1:00pm. The final session, a Q&A with NSF Math Institute representatives, ends at noon on Thursday, October 19. Research Sessions: The intended audience is graduate students and recent PhDs. Each participating institute will provide a speaker who will present an upcoming research program at the respective institute. All presentations will be expository in nature, intended for mathematical scientists and students not necessarily working in these areas but interested in learning about new developments and the possibility of spending some time at one of the Math Institutes. Due to the diverse portfolio of the institutes, it exposes participants to a broad range of topics in modern mathematics. These sessions run over the two days of the Modern Math Workshop: 1:00-4:30pm on the afternoon of Wednesday, October 18, and 9:00-10:45am the morning of Thursday, October 19. Mini-courses: Two half-day mini-courses will be offered on October 18, from 1:30-4:30pm, running concurrently: "Polynomial exact sequences in numerical analysis" and "Counting curves, intersections, and designs in hyperbolic geometry". These mini-courses are intended for undergraduate students. Keynote Speaker: At 4:30pm on Wednesday, October 18, all Modern Math Workshop participants are invited to enjoy the keynote lecture by Jesus De Loera (UC Davis), "The little theorem that could: How Sperner’s coloring lemma influenced Mathematics & Economics". Dr. De Loera's research encompasses a large number of pure and applied projects, including his work in Convexity and Combinatorial Commutative Algebra, as well as his work in Combinatorial Optimization and Algorithms. Q&A: The closing session of the workshop is a Q&A with NSF Math Institute representatives, 11:30am-12:00pm on Thursday, October 19. The intended audience is graduate students and recent PhDs. Each participating institute will provide a speaker who will present an upcoming research program at the respective institute. All presentations will be expository in nature, intended for mathematical scientists and students not necessarily working in these areas but interested in learning about new developments and the possibility of spending some time at one of the Math Institutes. Due to the diverse portfolio of the institutes, it exposes participants to a broad range of topics in modern mathematics. 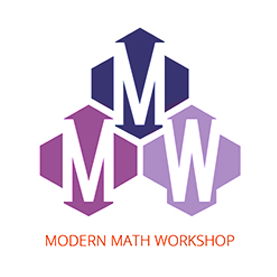 These sessions run over the two days of the Modern Math Workshop: 1:00-4:30pm on the afternoon of Wednesday, October 18, and 9:00-10:45am the morning of Thursday, October 19. Two half-day mini-courses will be offered on October 18, from 1:30-4:30pm, running concurrently: "Polynomial exact sequences in numerical analysis" and "Counting curves, intersections, and designs in hyperbolic geometry". These mini-courses are intended for undergraduate students. The NSF math institutes' networking reception will immediately follow the keynote lecture at 5:30pm on Wednesday, October 18. This reception is sponsored by Brown University's Department of Math, Department of Applied Math and The Office of Institutional Diversity and Inclusion. The closing session of the workshop is a Q&A with NSF Math Institute representatives, 11:30am-12:00pm on Thursday, October 19. Sperner's lemma states that a certain way of coloring triangulations of an n-dimensional simplex must contains at least one cell colored with a complete set of n colors. This simple result has nevertheless great depth as it is equivalent to Brouwer's fixed point theorem and it has strong connections to Borsuk-Ulam theorem and other classical results in topology. Sperner's lemma has many applications too: it has been used for computation of fixed points, in root-finding algorithms, in fair division (cake cutting, rental agreements) algorithms and it is at the foundation of the proofs of existence of Nash equilibria in Game theory. Several fascinating variations have been discovered and applied in recent years and there is renewed interest by theoretical computer scientists to find algorithmic versions. In my talk I will convince a non-expert why everyone should know about this lovely easy-to-understand, yet powerful, mathematical result. Jesús De Loera is a Professor of Mathematics at UC Davis. His work includes over 80 papers and books in Convex Geometry, Combinatorics, Algebra, Algorithms and Optimization. He received an Alexander von Humboldt Fellowship in 2004 and the 2010 INFORMS computer society prize. He is a fellow of the American Mathematical Society since 2014. For his mentoring and teaching he received the 2013 UC Davis Chancellor's award for mentoring undergraduate research and, in 2017, the Mathematical Association of America Golden Section Award. He has supervised eleven Ph.D students, and over 50 undergraduates research projects. He is an associate editor for 'SIAM Journal of Discrete Mathematics' and 'SIAM journal of Applied Algebra and Geometry'.